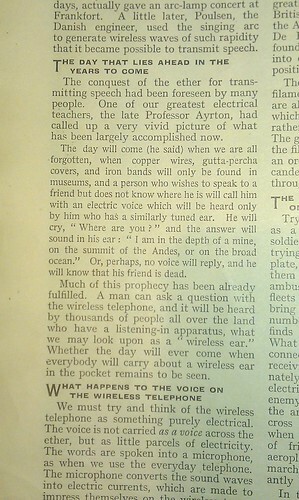 The day will come (he said) when we are all forgotten, when copper wires, gutta-percha covers, and iron bands will only be found in museums, and a person who wishes to speak to a friend but does not know where he is will call him with an electric voice which will be heard only by him who has a similarly tuned ear. He will cry, “Where are you?” and the answer will sound in his ear: “I am in the depth of a mine, on the summit of the Andes, or on the broad ocean.” Or, perhaps, no voice will reply, and he will know that his friend is dead. quote attributed to William Edward Ayrton.